Researchers from the Australian Research Council’s Centre of Excellence for Coral Reef Studies took this picture of a shark eating another shark near the Great Barrier Reef. Nature is crazy! The shark being eaten is a bamboo shark. The shark doing the eating is a tasseled wobbegong(!! 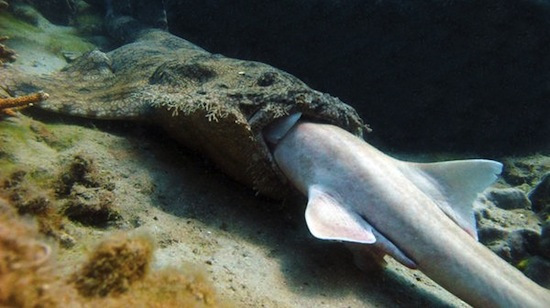 ), a type of “carpet shark” that will hang out, camouflaged on the floor, and then munch the hell out other sharks. But as Grist List likes to remind you, Australia and the Great Barrier Reef are screwed. So screwed. If we want to protect the ability of sharks to eat other sharks, swift action on climate change is essential.